Dust is one of the hassles we, as human beings, will have to live with. Our body sheds its skin regularly by having it flake into dust, which gets on and into everything: in our homes, workspaces, even play and storage areas. Such small amounts of dust, though, may be collected with conventional vacuum cleaners. This is simply not the case with woodworkers, though, as they have to contend with the dust created from constantly cutting into the interlocking fibers that are the main structural component of wood. This means that sheds, shops and many other areas used by woodworkers will often be filled with amounts of dust too large for a conventional vacuum cleaner to handle. This is where they turn to heavy duty dust collection systems to do the job. Using dust collection systems will be to the great benefit to any woodworker. These systems, when properly positioned in a work shed or shop area, will keep dust out of the way, ensuring that the surfaces you work on will be kept clean and, well, workable. In addition, having dust collection systems in operation in the shed or shop will greatly reduce the risk of fire. Ask any camper or survival enthusiast, and they will tell you how easily sawdust and wood shavings can burst into flame when heated. Having sawdust and wood shavings, side effects of any woodworking activity, simply lying around the shed, then, is a dangerous fire hazard. Thus, dust collection systems are not only for convenience, but for fire safety as well, as dust and other similar particles will be filtered away into a storage area that is free from potential sources of heat. There are even health benefits to be gained upon having dust collection systems constantly running through your work area. Dust, after all, is a near microscopic irritant of a particle, and inhaling too much of it, usually unconsciously, may cause anything from nasal irritation and allergies to bronchitis, emphysema and even lung cancer in the most extreme cases (usually when the person has been inhaling wood dust for years). Keeping dust collection systems around, therefore, can protect your health, in addition to the two preceding purposes. Dust collection systems come in many different shapes, sizes and power ratings, depending on how large or how small your woodworking operation is. 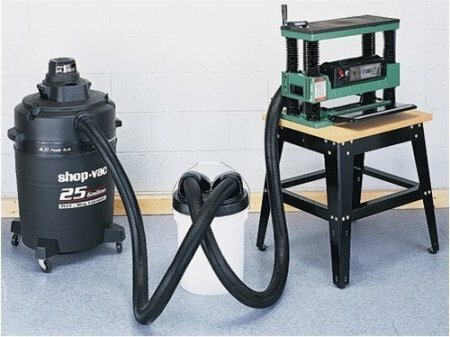 Usually, the power of the system must be more or less proportional to the size of the operation: small shops, from personal craft spaces to one manned commercial spaces can make do with a 3 horsepower dust collecting system, while a four person operation might require something along the lines of 10 horsepower, and more ventilation ducting, so that the system may cover the larger area.